We had worried about the rain forecasted on our spring Saturday in Prague. It actually turned out to be a beautiful sunny day for a foodie walk through Old Town and the surrounding area. Our guide lead us through small, out of the way streets, passages and gardens on our quest for some of the best local foods of the Czech Republic. Our meeting place at 12:30 was at a very Bohemian chocolate shop on Klimentska Street. Our small group of four couples were an international mix which all spoke English. We were joined by couples from England and Italy and a young US couple that are living in Spain while she attends and he teaches at a university in Barcelona. We find a unique commonality that we all love food! Our guide, Jan is from Prague but has lived in Seattle and San Francisco while working for Microsoft. As we got to know him, we learned that he is an aspiring artist with a young family that obviously loves the ins and outs of food. He bakes too. His speciality is cheesecake. Quite the diversified businessman, along with setting up and guiding the Eating Prague Tours, he also guides photo tours around Prague. 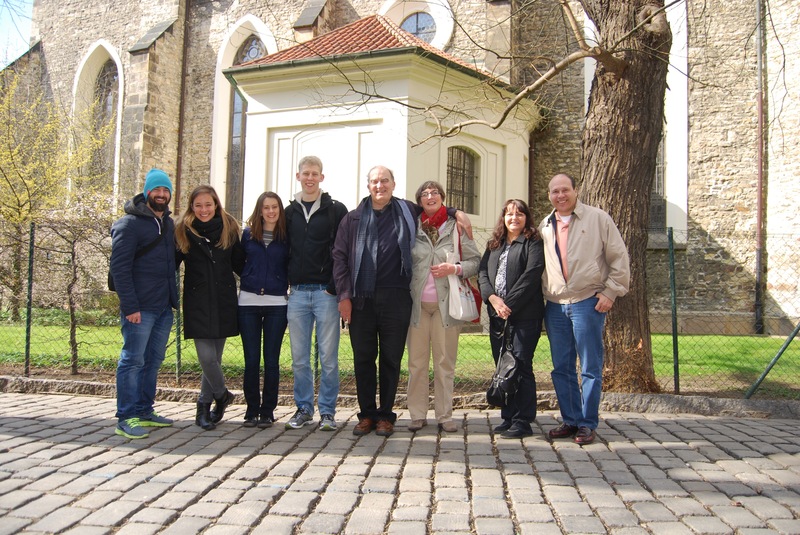 We learned from our guide that Eating Prague Tours was founded and is owned by an American now living in Rome. His ‘Eating’ dynasty now includes Rome, London, Amsterdam and of course Prague. Our tasting began with dessert! Great way to begin I think! The sugar will help with all the walking we will be doing during our next four hours. Choco Cafe is a family owned small chocolate shop in a quaint setting on an off street. The decor is a mixture of funky, mixed-matched tables and chairs with the walls covered with posters celebrating Chocolate. The smells in the air are intoxicating! 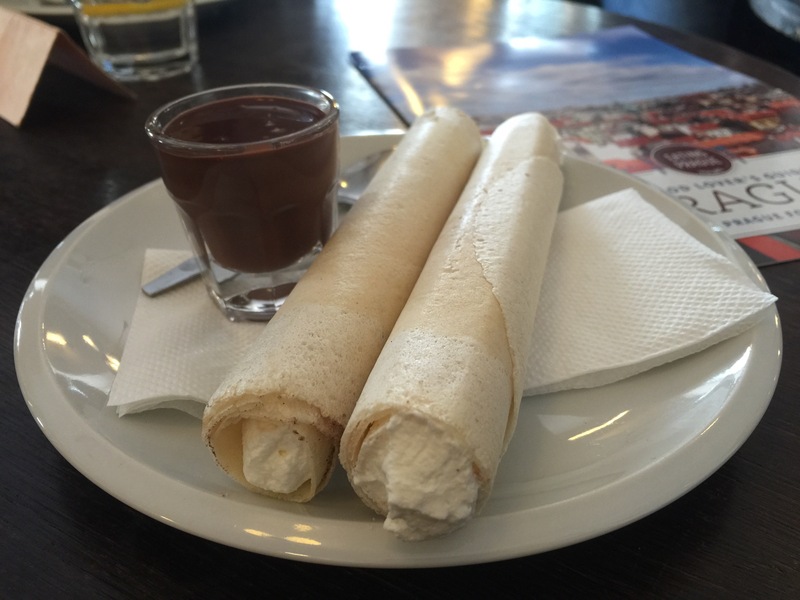 Light, flaky Horice rolled wafers filled with a lovely cream which you dip in a warm, rich, thick chocolate sauce. This pastry was made legendary by Napoleon and is served in only a few restaurants. Absolutely heavenly way to begin the tour! We then began our walk on small streets through the Jewish Quarter to a pair of businesses only separated by a narrow passage on Dlouha Street. 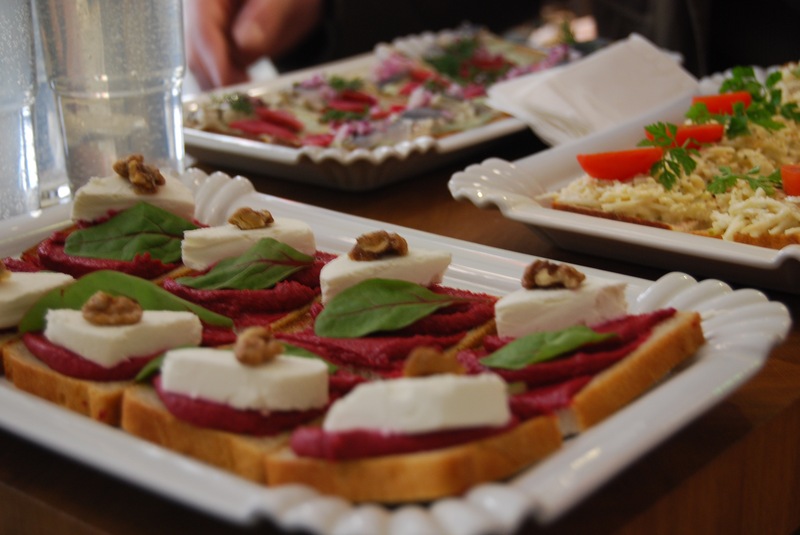 Our first offering was a trio of gourmet open faced sandwiches from Sisters. We began with a lovely beet spread with a chunk of goat cheese and a beet leaf. Then came a lovely slaw made of celery root and finally a mixture of cod. These were served with a lovely elderberry flavored lemonade. Just across the passage way is Nase Maso, a meat market that offers some of the best meats in Prague. Their reputation of using local, high quality meats has caught the attention of Prague chefs who purchase their offerings for service at their restaurants. The line at their counter proves they are loved by the locals as well. We tasted three sliced meats including ham and salami. 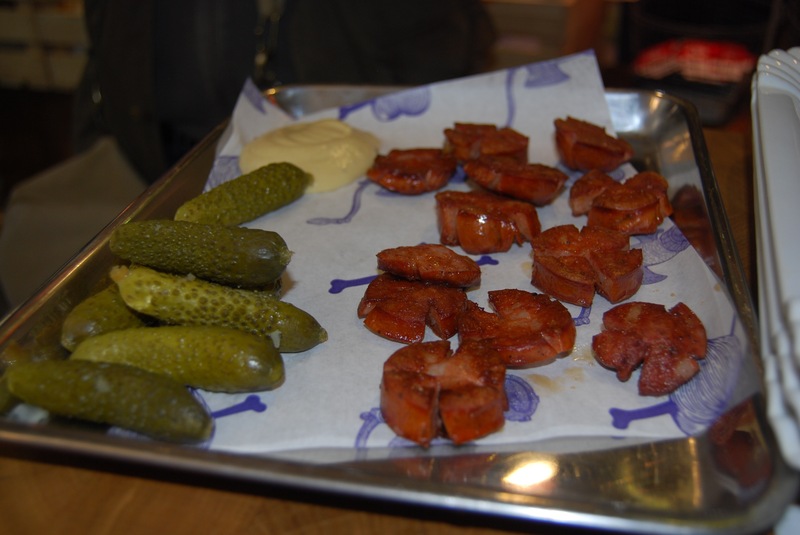 Their traditional sausage, mustard and gherkin pickles were my personal favorite. Naso Maso is more than just a butcher shop. They will grill the meats you choose from their counter and offer plates that include traditional artisan bread baked locally. A young man who was attempting to enjoy his lunch while our group basically surrounded him and his table, declared that his pork cheek was the best that he had ever tasted. He noted that it was flavorful and fork tender. I must say that I was excited that our next restaurant was on our tour! I had inadvertently found this charming place while searching for places to eat in Prague. It’s setting in a bell tower offers the ambience that would be appreciated by young lovers (ask for the table for two tucked between the bell and window) and history buffs alike. It is not obvious there is a dining establishment on the upper floor from the outside, so it is frequented mainly by locals. Though it is located in a tourist area, people just walk right by. Our guide refused to tell us what we would be tasting even after the wait staff placed a bowl in front of each of us. It seams that a lot of people are put off by sauerkraut. Sauerkraut in Eastern Europe does not have a bold vinegar taste like the jars we buy in our American grocery stores. It has a much smoother taste when made from scratch. 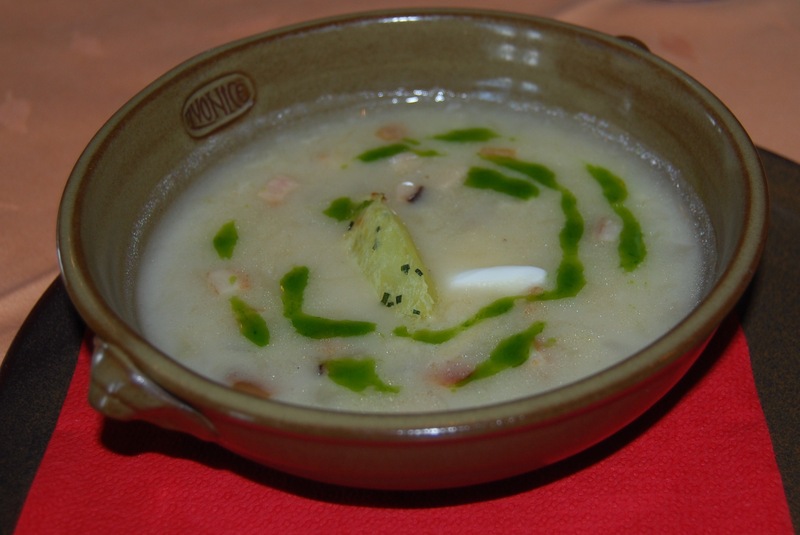 This chef is said to make the best Old Bohemian Sauerkraut soup in the world. The cabbage is sliced razor thinly in a velvety sauce with a dollop of sour cream and a drizzle of basil cream sauce. Absolutely fabulous! Don’t let the ‘S’ word scare you! 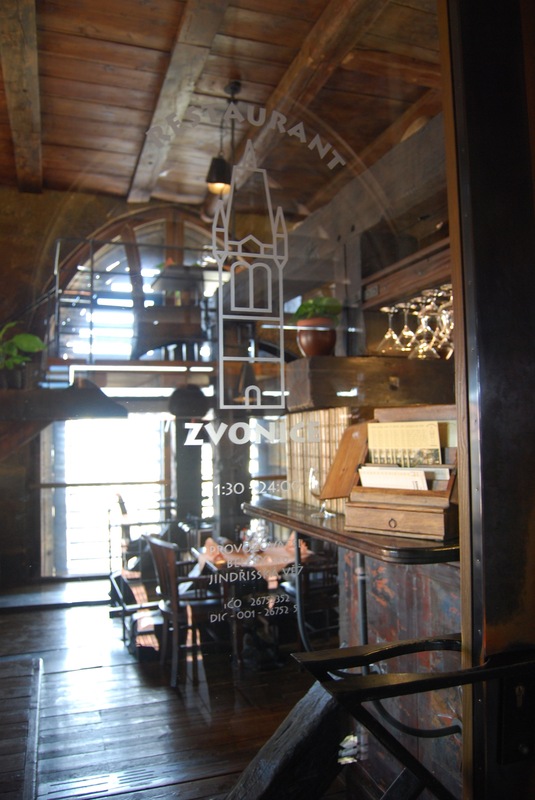 Look for Restaurant Zvonice on Jindrisska Vez the next time you are in Prague. You will not be disappointed. The well hidden little coffee shop, Styl & Interier on Vodickova is down a passage just off Wenceslas Square. It is an interior decor shop turned cafe due to their unique wine and pate offerings. This mom and daughter duo have began to be so popular that they are now expanding and installing a full kitchen. 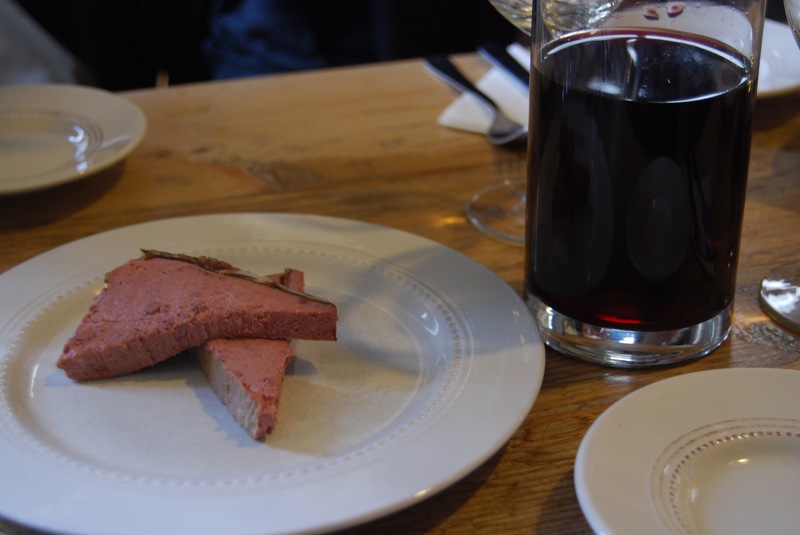 At this stop we were offered a lovely pate with a hint of bacon along with a slightly spicy celery salad with cranberries that I would definitely love to have the recipe for! Their handcrafted wine was made with fresh black currants. Quite smooth and a nice fragrance. I thought it was really lovely! Bottles are available for purchase as our young Italian tour-mates found to be a nice souvenir. A glass or two would be especially nice while enjoying the sunshine in their adjacent garden patio. 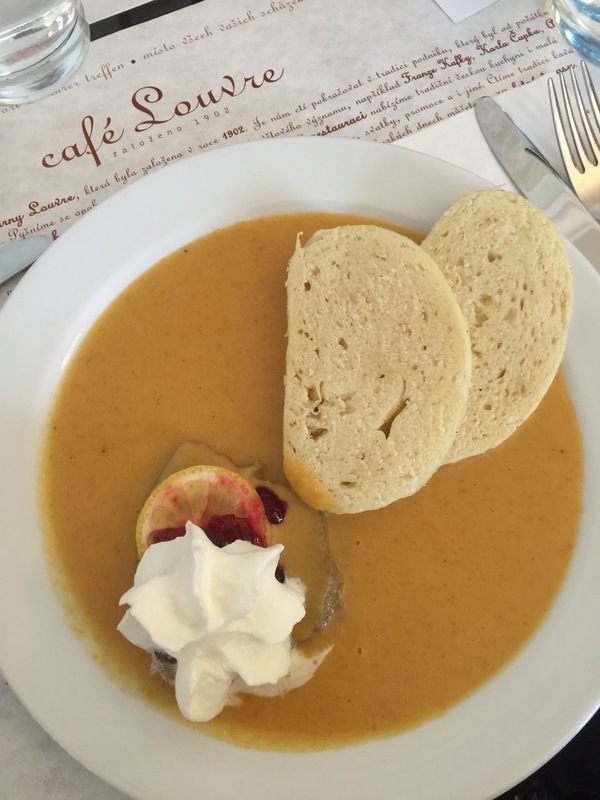 Café Louvre was also on my radar for a visit! So happy this was an included stop! This is the place for people watching. I’m told that prominent Europeans choose to come here to see and be seen. 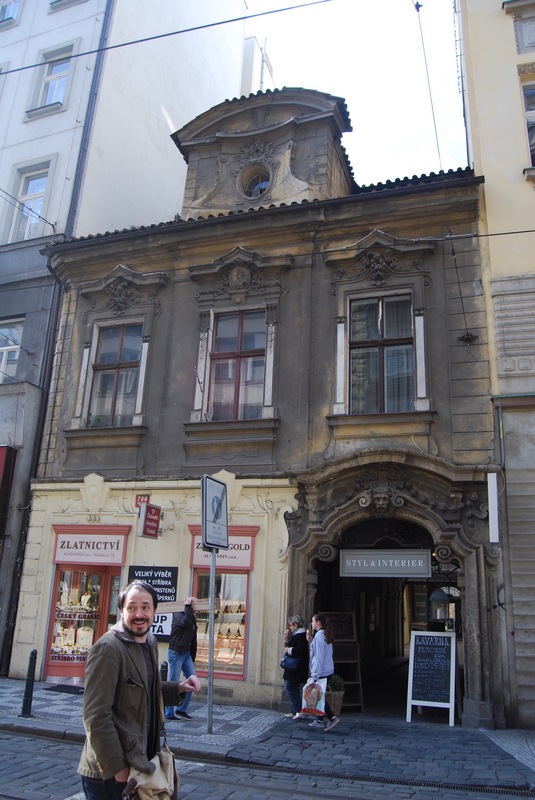 Located a flight or so up in a historic building this jewel offers traditional dishes like the Svíčková or Braised Beef that we were served. Tender beef in a vegetable cream sauce with bread dumplings and cranberries. Load your fork with all the components for that perfect bite! Had the room not have been full of patrons, I would have given more serious thought to licking my plate. We were given an abbreviated serving for our tasting. I can’t imagine what a full entrée would do to me!! My diet was suffering. I had tried to be ‘good’ up until this point. Then they brought out dessert! Ahhh. The Louvre’s custard cream sauce! 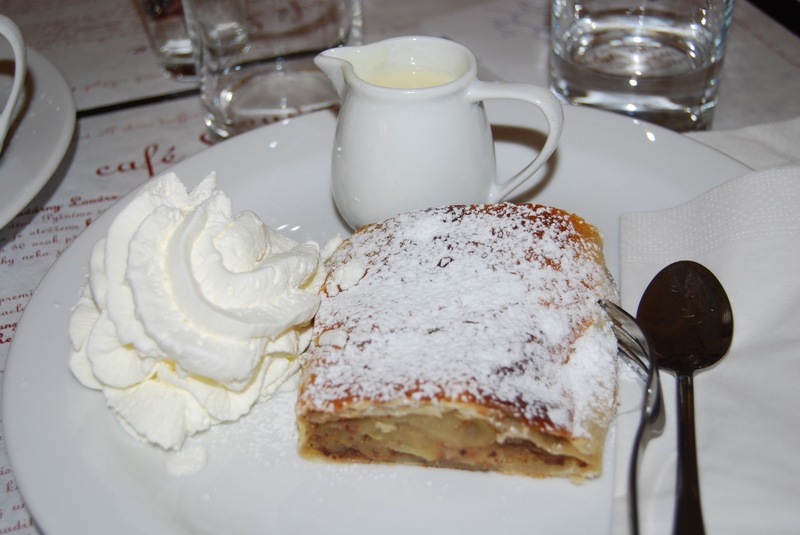 The Louvre’s apple strudel was special. Why? It was the creamy vanilla custard sauce that they paired with their flakey, apple goodness. That sauce is amazing! I’m definitely trying this at home! All in all, I would recommend Eating Prague Tours to anyone. It’s a nice mix of food, good conversation and a nice informative walk through some of the back streets around the tourist areas of Prague that you may not see otherwise. Our guide did a nice job of showing us some historic places along with some that were a bit off beat. A nice mix. A lovely day. Come hungry. Leave satisfied. Don’t make dinner plans. *** I was not compensated for this review. They had no idea who I even was. The opinions are truly my own. I’d happily go on any of this companies tours. Looking forward to seeking them out. Hope they expand! May I suggest Florence?